Yeah that's the best I had to describe this one, "super group stuff," because I wanted highlight that when a group is referred to as "super" it often precludes a positive review. You set anything up as so damn super and it's more inevitable it will fail due to its assumption of superiority. Luckily I didn't know any of that going into Serpent's Curse, the first release of Heads for the Dead, which consists of two primary members who have been in a number of bands you've probably never heard of. Since I need to have some purpose for all the super talk here let me ask this: how can a group be of the super variety if it only consists of two members? I feel like that's a bare-minimum stretch of the definition, and the cover by Branca Studio gives you a different idea of what it sounds like anyway, but thankfully this album isn't a bare-minimum of effort so it's super in its own way. I'm in a unique position to review Serpent's Curse because I listened to it far too many times. That was entirely an accident due to pressures from a super tight schedule at work for the past two weeks and my constantly forgetting to remove the tracks from my antiquated MP3 player that is no longer super but works. So it served its purpose again and again, which gave me an entirely different perspective. Heads for the Dead is a huge mixture of elements under the death metal banner torn in the winds, but unlike most they can wield the ever-successful trick of actually good riffs and varied elements. 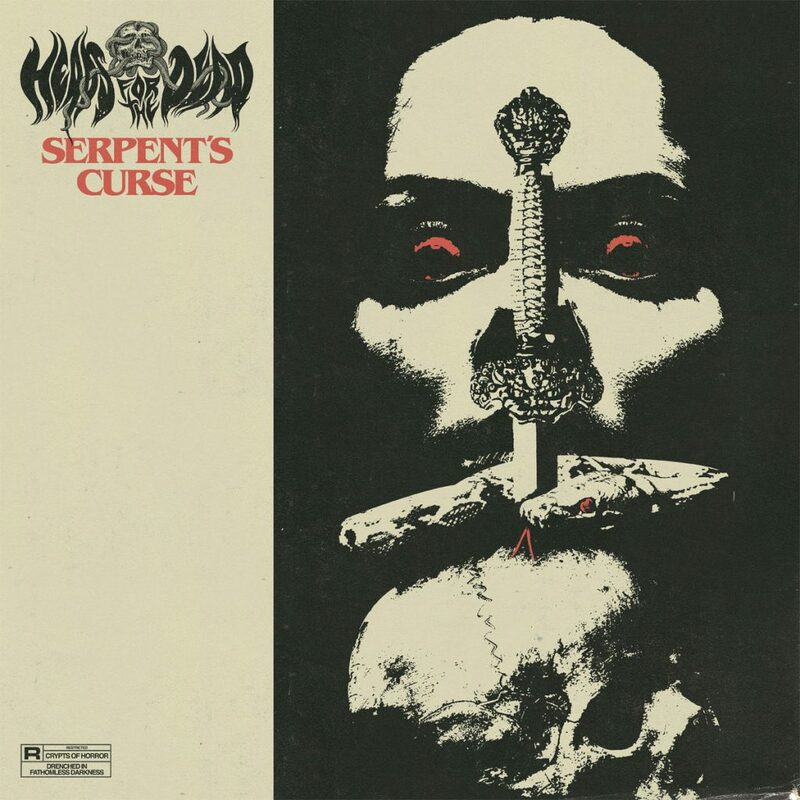 Several sections of Serpent's Curse are clever in that regard, though certainly not super, such as the title track, which opens with some atmospheric pounding and eventually pulls out a tremolo rip that is particularly fitting. But the album also has a sense of sidekick with some tracks much shorter than others including two placed in seemingly random points as atmospheric filler. Further, after the number of listens I gave it Serpent's Curse burned its own cape. Meaning it's more of a 3-issue side-plot from a larger series. It's a smashing listen when you first give it a spin, but it lacks the ability to retain your attention after a few until it becomes more forgettable than super.